The Australian High Commissioner to Aotearoa (New Zealand) very kindly provided funding for Hakono Hararanga to clean-up beaches on the uninhabited motu (islets). Our aim is to remove as much plastic pollution from our food supply as possible. 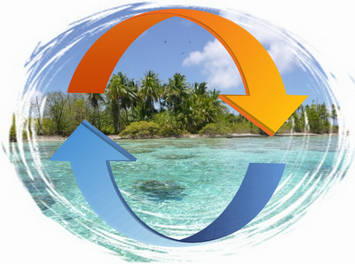 Our atoll is overwhelmed with oceanic debris littering our beaches, reefs and lagoon. We do not like eating plastics: they are in our fish, shellfish and seabirds. Our women pass toxicants on to their babies when breast-feeding. Our Lagoon, Our Life project is supported by the Australian Government and implemented by Hakono Hararanga at Tongareva Atoll. Most of the rubbish comes from the far-away industrial consumer world. It really has no place being on a very remote tropical atoll in Oceania. The commonest items are water bottles, lighters, flip-flops, household products, and millions of plastic fragments. These break down slowly and release the chemical components into the ocean. Soft plastics decompose to micro-fibres and these are consumed by marine creatures: we then eat animals directly or else biomagnification occurs in the foodweb. Either way: we make our body proteins from the food we eat!! !